Artificial Intelligence (AI) is rapidly transforming the pharmaceutical and health care industries. 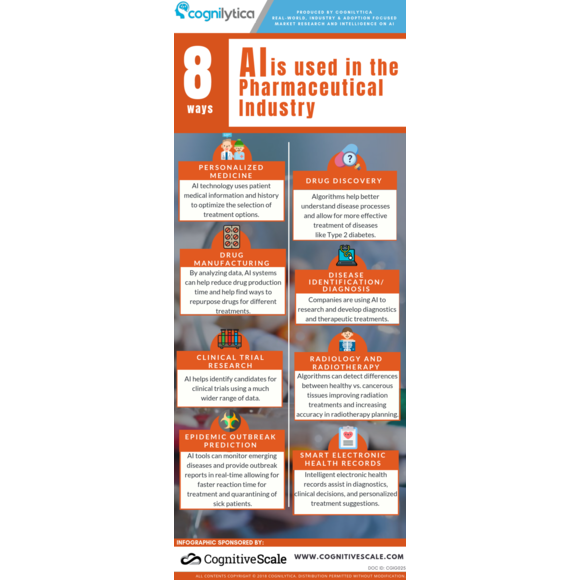 Check out this infographic from Cognilytica to learn the ways in which AI, Machine Learning (ML), and Cognitive Technologies are being applied to change the ways that drugs are being discovered, manufactured, tested, used, and patients treated and cared for. CognitiveScale pairs humans and machines to augment human potential. Augmented intelligence is a new class of technology, data, methods, and skills focused around a business-led portfolio of industry-optimized AIs. With people and machines working together to address some of the most complex enterprise problems, AI can drive transformative change within an organization, deliver true business outcomes quickly, and greatly improve shared employee knowledge when paired with machine-delivered insights. CognitiveScale Cortex 5 software helps businesses apply Artificial Intelligence and Blockchain technology to solve complex business problems at scale for financial services, healthcare, and digital commerce markets. Our award-winning software is being used by global leaders such as USAA, Morgan Stanley, NBC, JPMC, ExxonMobil, and MD Anderson to increase user engagement, improve decision-making, and deploy self-learning and self-assuring business processes. 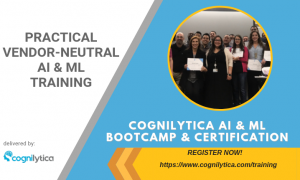 Headquartered in Austin, Texas, CognitiveScale has offices in New York, London, and Hyderabad, India, and is funded by Norwest Venture Partners, Intel Capital, IBM Watson, Microsoft Ventures, and USAA. Artificial Intelligence in Pharmacy: Are You Ready?